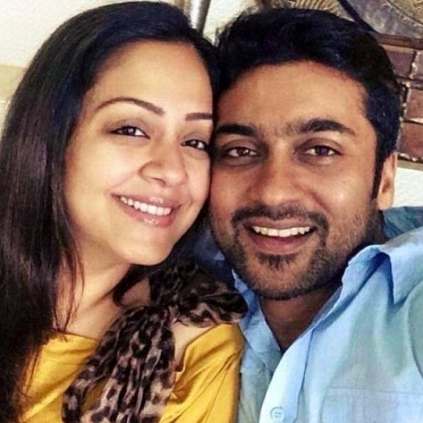 INTERESTING: JYOTHIKA REVEALS IF SHE WOULD ACT WITH SURIYA IN THE FUTURE! Jyothika, as part of Magalir Mattum promotions, was seen in a live Facebook chat with her fans, where she answered few interesting questions. Here is a compilation of those. Q: Your favourite actor apart from Suriya? Q: How did you feel when you get the offer for Mani Ratnam sir's next film? Karthi only heard this information first and he told me that Madras Talkies wanted to contact me for Mani sir's next film. I was damn excited and said yes to the project, the very next minute, without any second doubts. Q: How is Dev doing? What kind of a character is he? Q: Can you tell us about your working experience with Thala Ajith. I worked in a few films together with Ajith sir during my starting stages of the career. He is a wonderful person and a thorough gentleman. Only when we both were acting together, Ajith - Shalini love story was at high point. Q: We saw Madhavan's cameo in Magalir Mattum, though we expected Suriya to play that role. Will you act with Suriya in any of your upcoming projects? Actually, to be frank, we are ready to act together, but we haven't got any exciting scripts yet. We didn't get any good story to act in. If we get an exciting script, we would definitely act. We are ready. And regarding Magalir Mattum cameo, we wanted it to be a surprise casting and that is why we made Maddy do it. Had it been Suriya, it would have been an obvious choice. Q: Among the both of you, who proposed first? Suriya or Jyothika? Both of us don't remember that. We were in a relationship for quite a long time, before getting married. Suriya would say, I only proposed him, but I'd tell him that I didn't. We actually do not know who proposed first. People looking for online information on Jyothika, Magalir Mattum, Suriya will find this news story useful.